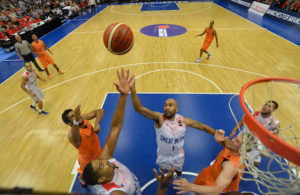 Great Britain’s hopes of reaching Eurobasket are still alive after they overcame their own frailties to sweep past Ukraine 57-49 in Guildford. And it was Jo Leedham who was the hosts’ destroyer, emerging from a slump to hit a trio of three-pointers in a storming spell at the start of the fourth quarter that pushed Tom Maher’s side beyond reach. The WNBA draftee, inconsistent from long-range this summer, could not miss. With 9 of her game-high 18 points coming with the game on the line, GB were spurred by her imprint and they closed the door to their visitors to move to 2-1 in this campaign. And they now know the group remains wide open with Slovakia, who host GB in Kosice on Monday, surprisingly losing 63-58 to Germany. Again, woeful free throws could have damaged the hosts’ cause. Again, there were too many turnovers, ill-advised outside shots and defensive lapses. Inna Kochubei, who led the guests with 11 points, hit a three to open up a 13-8 gap after seven minutes that helped secure a 15-9 cushion at the end of the first. It got worse before it got better. In a three-minute spell, GB had four misses and two turnovers and when Olena Ogorodnikova downed a three midway through the period, Ukraine’s lead loomed large at 23-12. It needed a spark from GB. Maher lit the torch paper in a time-out. Kim Butler ignited a 7-0 close to the half that brought her side back to life. When Leedham hit two late free throws, the deficit stood at 25-21 at the interval. There was hope, despite the imperfections. Whatever chapter of his tough-talking handbook Maher pulled out in the locker room, it made sure the hosts did not relent. The Australian pulls few punches but he watched his side storm ahead for the first time with 7.56 left in the third when Julie Page sank one foul shot. Ukraine hit back. GB kept responding. Azania Stewart hit three consecutive points to re-take the initiative and then Rachel Vanderwal, in an impressive cameo, converted a steal which opened up a 31-27 gap. For the first time, Maher’s women had a small breathing space, fuelled by their best defensive spell. And although Ukraine twice levelled again, Natalie Stafford downed back to back three-pointers to keep the momentum going as the home side took a 38-35 lead into the final stanza. It was Leedham’s time to shine. Her shot will never be described as classic by the purists but there is a reason she is in the all-time top five scorers in NCAA history. Three times, she converted from long range as GB opened up a 47-37 advantage with 6.46 left and it just sucked the air out of the Ukrainians’ challenge. Wade-Frey and Stewart then split the spoils in another 8-0 burst and when the guests took a time-out with 3.22 left, they trailed 55-41. There was no way back, even when Ukraine reeled off eight unanswered points. GB celebrated. What matters less was the performance, just the win that keeps them in the hunt. 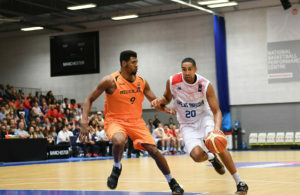 Notes: Several of the Great Britain men’s players and coaching staff were in attendance including Chris Finch, Kieron Achara and Dan Clark. 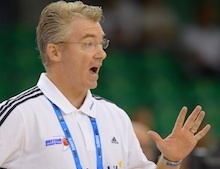 The men received a boost elsewhere as their closest qualifying group rivals Macedonia were upset 85-82 by Hungary. Elsewhere in their group, Ukraine beat Bosnia 87-69.